This Chrome bar hinge set is ideal for replacing old, dis-coloured or broken hinges on your existing wooden seat. Q. What are the max and min distances between the bolts that secure the hinge to the toilet bowl? Hi Patrick, this toilet seat is adjustable from 150mm-160mm. Hope this helps! 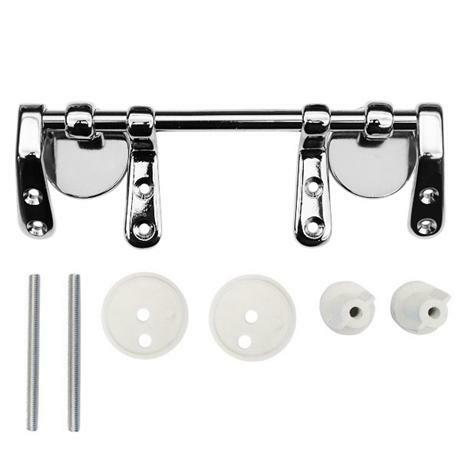 Hi Torbenmo, You can find expected delivery costs for this Toilet Seat Hinge Set underneath the add to basket button. Standard UK Mainland delivery is £2.96. Value for money as described. Excellent. Prompt delivery, good price and just the product I was looking for. Good, but could be even better! The conical washers were much appreciated. The product would be even better if it included (a) the plastic/rubber pads that go between the wooden seat and the chinaware and (b) eight screws to fit the hinges to the seat and cover. The pads could then be of a thickness that was exactly compatible with the height of the hinge, meaning that all pads would be in contact with the chinaware instead of just the front pads. arrived quickly - easy to fit - looks greatno more to add!